Figure A. FITC conjugated Mouse anti Bovine CD21 (MCA1424F) and RPE conjugated Mouse IgG1 isotype control (MCA928PE). Figure B. FITC conjugated Mouse anti Bovine CD21 (MCA1424F) and RPE conjugated Mouse anti Bovine CD8 (MCA837PE). All experiments performed on red cell lysed bovine blood gated on lymphocytes in the presence of 10% bovine serum. Data acquired on the ZE5™ Cell Analyzer. Mouse anti Bovine CD8 antibody, clone CC63 used for the identification of CD8 expressing cells in the bovine nasopharynx by immunofluorescence. 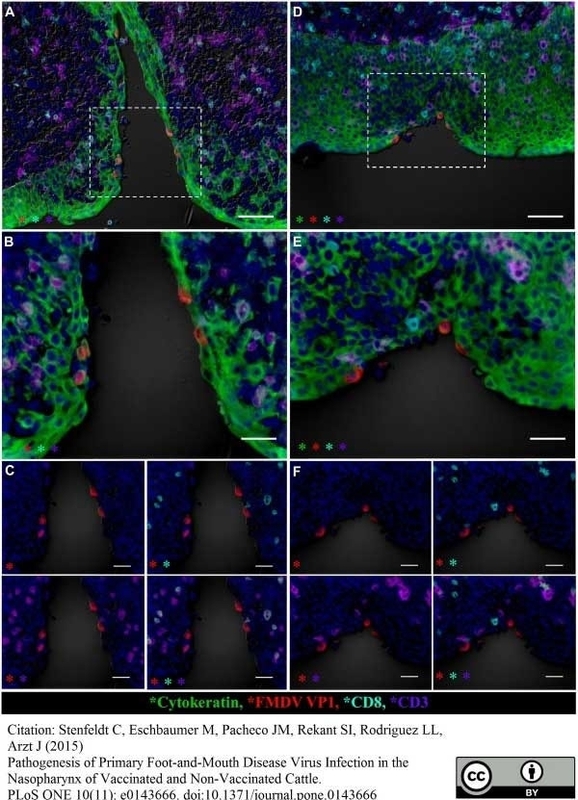 Nasopharyngeal primary infection sites of vaccinated cattle are infiltrated by CD8+/CD3- (presumptive NK) cells at 24 hpi. Multichannel immunofluorescent technique. A). FMDV VP1 (red) protein within cytokeratin+ cells (green) in epithelial crypt of the nasopharyngeal mucosa of non-vaccinated steer at 24 hpi (animal number 3). CD8+ (aqua)/ CD3+ (purple) double-positive CTLs are present in the subepithelial compartment amongst larger populations of CD8-/CD3+ T-lymphocytes. 20x magnification, scale bar 50μm. B) 40x magnification of region identified in (A), demonstrating consistent co-localization of CD8 (aqua) with CD3 (purple). Scale bars 25μm. B) Select channels of image shown in (B). CD3+ cells (purple) include single-positive (T-lymphocytes) or CD8+/CD3+ double-positive (CTLs). CD8 (aqua) is exclusively detected in combination with CD3 (purple). Scale bars 25 μm. D) FMDV VP1 (red) protein co-localize with cytokeratin (green) in a focal surface erosion within follicle-associated epithelium of nasopharyngeal mucosa of vaccinated steer at 24 hpi (animal number 11). A distinct population of cells defined as presumptive NK-cells based on a CD8+ (aqua)/CD3- (purple) phenotype is present in submucosal and epithelial compartments surrounding the focus of infection. A smaller population of CTLs (CD8+/CD3+) is present amongst abundant non-CTL T-lymphocytes (CD8-/CD3+). 20x magnification, scale bar 50μm. E) Higher magnification of region identified in showing CD8+/CD3- cells (aqua) representing presumptive NK cells in close proximity of FMDV infected focus. 40x magnification, scale bars 25 μm F) Individual channels of image shown in (E) demonstrating inconsistent co-localization of CD8 (aqua) and CD3 (purple). Scale bar 25 μm. Pathogenesis of Primary Foot-and-Mouth Disease Virus Infection in the Nasopharynx of Vaccinated and Non-Vaccinated Cattle. 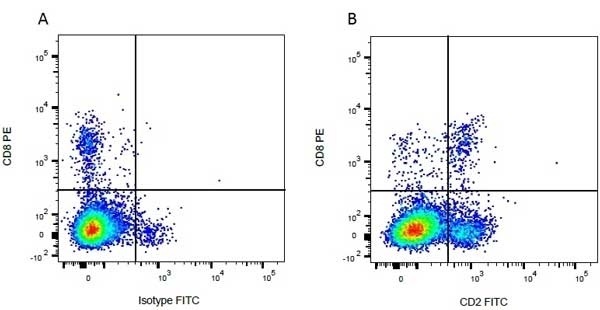 RPE conjugated Mouse anti Bovine CD8 antibody, clone CC63 (MCA837PE) used to detect cytotoxic T-cells in bovine peripheral blood by flow cytometry together with APC conjugated Mouse anti Bovine CD4 antibody, clone CC8 (MCA1653) used for the identification of helper T-cells in the same samples. 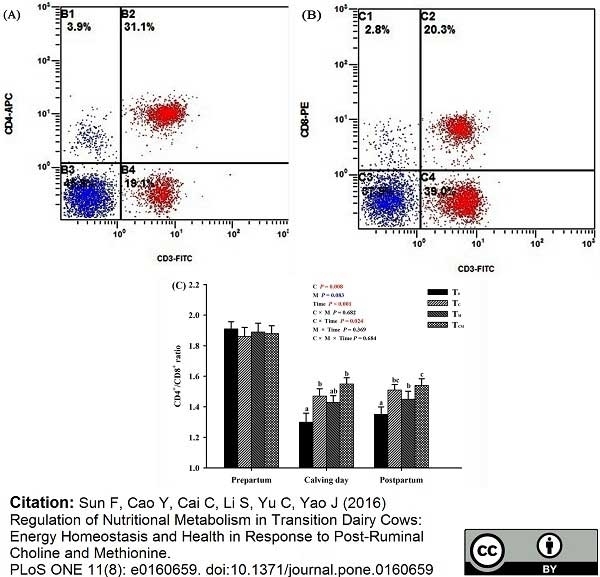 Regulation of Nutritional Metabolism in Transition Dairy Cows: Energy Homeostasis and Health in Response to Post-Ruminal Choline and Methionine. Figure A. FITC conjugated mouse anti bovine CD2 (MCA833F) and RPE conjugated mouse IgG2a isotype control (MCA929PE). Figure B. FITC conjugated mouse anti bovine CD2 (MCA833F) and RPE conjugated mouse anti bovine CD8 (MCA837PE). All experiments performed on red cell lysed bovine blood gated on mononuclear cells. Figure A. RPE conjugated mouse anti bovine CD8 (MCA837PE) and FITC conjugated mouse IgG1 isotype control (MCA928F). Figure B. RPE conjugated mouse anti bovine CD4 (MCA837PE) and FITC conjugated mouse anti bovine CD2 (MCA833F). All experiments performed on red cell lysed bovine blood gated on mononuclear cells. Figure A. A647 conjugated mouse anti bovine CD26 (MCA1652A647) and FITC conjugated mouse IgG2a isotype control (MCA929F). Figure B. A647 conjugated mouse anti bovine CD26 (MCA1652A647) and FITC conjugated mouse anti bovine CD8 (MCA837F). All experiments performed on red cell lysed bovine blood gated on mononuclear cells. Figure A. FITC conjugated mouse anti bovine CD8 (MCA837F) and A647 conjugated mouse IgG1 isotype control (MCA928A647). Figure B. FITC conjugated mouse anti bovine CD8 (MCA837F) and A647 conjugated mouse anti bovine CD26 (MCA1652A647). All experiments performed on red cell lysed bovine blood gated on mononuclear cells. 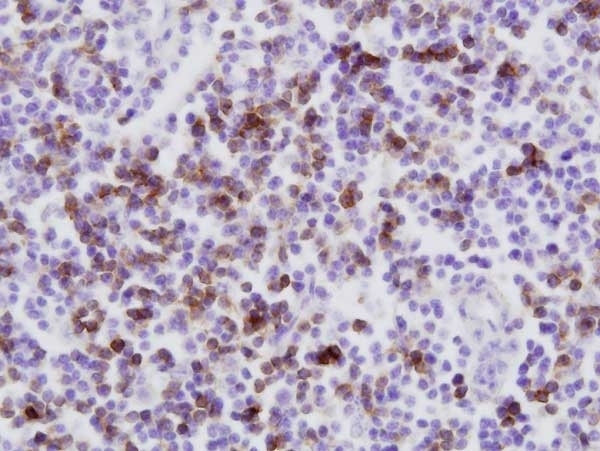 Mouse anti Bovine CD8 antibody, clone CC63 (MCA837GA) used for the identification of CD8 expressing lymphocytes in bovine tissue sections by immunohistochemistry on formalin fixed, paraffin sections. Immunohistochemical staining of CD8 + T cells of the Bovine mammary tissue using paraffin-embedded sections (A–C): (A) The intermediate immunoreactivity of CD8 + T lymphocytes (arrow) in the interalveolar connective tissue with the monoclonal antibody specific for CD8+ T cells in Bovine mammary tissue infected with BPIV-3. 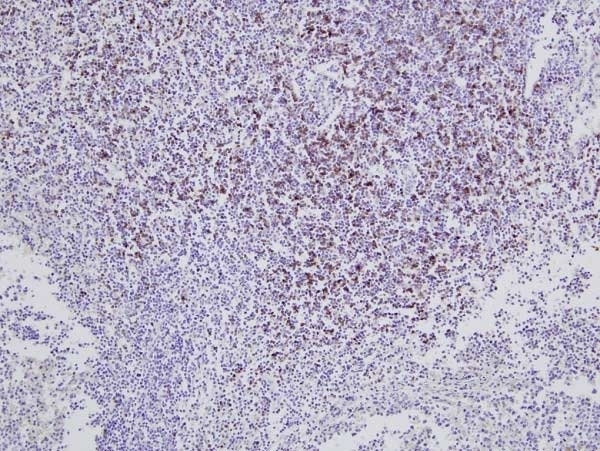 (B) The low immunoreactivity of T lymphocytes (arrow) in the interalveolar connective tissue with the monoclonal antibody specific for CD8+ T cells in Bovine mammary tissue infected with BoHV-1. (C) The high reactivity distributional of T lymphocytes in the interalveolar connective tissue with the monoclonal antibody specific for CD8+ T cells (arrow) in Bovine mammary tissue infected with BoHV-1 and BPIV-3. IHC. Bar, 20μm. From: Çomakli S, Özdemir S. Comparative Evaluation of the Immune Responses in Cattle Mammary Tissues Naturally Infected with Bovine Parainfluenza Virus Type 3 and Bovine Alphaherpesvirus-1. Pathogens. 2019;8(1). pii: E26. 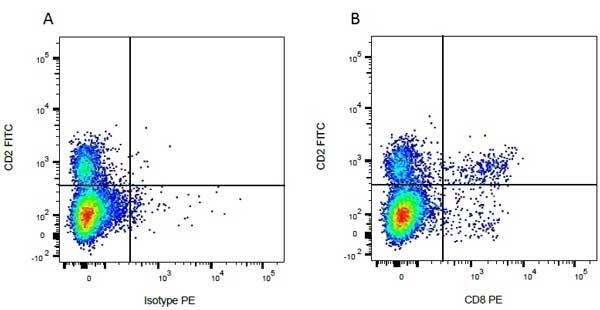 FITC conjugated Mouse anti Bovine CD8 antibody, clone CC63 (MCA837F) used for the evaluation of CD8 expression on ovine peritoneal cells by flow cytometry. 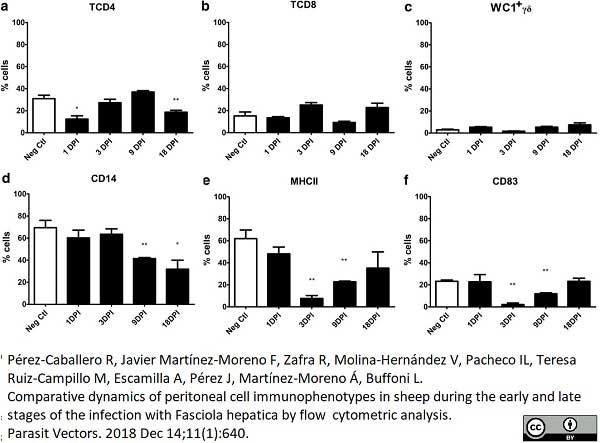 From: Pérez-Caballero R, Javier Martínez-Moreno F, Zafra R, Molina-Hernández V, Pacheco IL, Teresa Ruiz-Campillo M, Escamilla A, Pérez J, Martnez-Moreno Á, Buffoni L.
Comparative dynamics of peritoneal cell immunophenotypes in sheep during the early and late stages of the infection with Fasciola hepatica by flow cytometric analysis. Mouse anti Bovine CD8 antibody, clone CC63 reacts with the bovine CD8 antigen expressed by a subset of T lymphocytes. The antibody precipitates molecules of ~34 kDa and ~38 kDa under reducing conditions. Clone CC63 has been reported as being suitable for use on formalin dichromate (FD5) fixed paraffin embedded tissue with amplification and antigen retrieval techniques (Gutierrez et al. 1999). Spleen cells from an immunised mouse were fused with cells of the mouse NS1 myeloma cell line. MacHugh, N.D. & Sopp P (1991) Individual antigens of cattle. Bovine CD8 (BoCD8). Vet Immunol Immunopathol. 27 (1-3): 65-9. Gutierrez, M. et al. 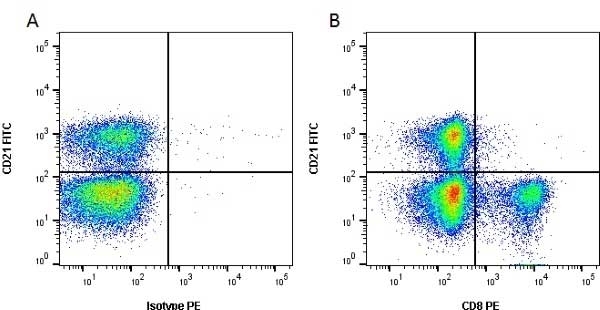 (1999) The detection of CD2+, CD4+, CD8+, and WC1+ T lymphocytes, B cells and macrophages in fixed and paraffin embedded bovine tissue using a range of antigen recovery and signal amplification techniques. Vet Immunol Immunopathol. 71 (3-4): 321-34. Twizere, J.C. et al. (2000) Discordance between bovine leukemia virus tax immortalization in vitro and oncogenicity in vivo. J Virol. 74 (21): 9895-902. Winkler, M.T. et al. (1999) Bovine herpesvirus 1 can infect CD4(+) T lymphocytes and induce programmed cell death during acute infection of cattle. J Virol. 73 (10): 8657-68. Winkler, M.T. et al. (2000) Persistence and reactivation of bovine herpesvirus 1 in the tonsils of latently infected calves. J Virol. 74 (11): 5337-46. Sidders, B. et al. (2008) Screening of highly expressed mycobacterial genes identifies Rv3615c as a useful differential diagnostic antigen for the Mycobacterium tuberculosis complex. Sanchez, J. et al. (2011) Microscopical and immunological features of tuberculoid granulomata and cavitary pulmonary tuberculosis in naturally infected goats. J Comp Pathol. 145 (2-3): 107-17. La Manna, M.P. et al. (2011) Expansion of intracellular IFN-γ positive lymphocytes during Mycoplasma agalactiae infection in sheep. Res Vet Sci. 91 (3): e64-7. Fulton, B.E. Jr. et al. (2006) Dissemination of bovine leukemia virus-infected cells from a newly infected sheep lymph node. Harris, J. et al. (2002) Expression of caveolin by bovine lymphocytes and antigen-presenting cells. Liebana, E. et al. (2007) Distribution and activation of T-lymphocyte subsets in tuberculous bovine lymph-node granulomas. Lynch, E.M. et al. (2010) Effect of abrupt weaning at housing on leukocyte distribution, functional activity of neutrophils, and acute phase protein response of beef calves. BMC Vet Res. 6: 39. Lacroux, C. et al. (2012) Prionemia and leukocyte-platelet-associated infectivity in sheep transmissible spongiform encephalopathy models. J Virol. 86 (4): 2056-66. Constantinoiu, C.C. et al. (2010) Local immune response against larvae of Rhipicephalus (Boophilus) microplus in Bos taurus indicus and Bos taurus taurus0 cattle. Int J Parasitol. 40: 865-75. Brodzki, P. et al. (2014) Phenotyping of leukocytes and granulocyte and monocyte phagocytic activity in the peripheral blood and uterus of cows with endometritis. Romero-Palomo F et al. (2015) Immunopathologic Changes in the Thymus of Calves Pre-infected with BVDV and Challenged with BHV-1. Leite FL et al. (2015) ZAP-70, CTLA-4 and proximal T cell receptor signaling in cows infected with Mycobacterium avium subsp. paratuberculosis. Vet Immunol Immunopathol. 167 (1-2): 15-21. Silva, A.P. et al. (2015) Encapsulated Brucella ovis Lacking a Putative ATP-Binding Cassette Transporter (&Detla;abcBA) Protects against Wild Type Brucella ovis in Rams. PLoS One. 10 (8): e0136865. Schmidt, N. et al. (2018) Decreased STEC shedding by cattle following passive and active vaccination based on recombinant Escherichia coli Shiga toxoids. Vet Res. 49 (1): 28. Benedictus, L. et al. (2019) Immunization of young heifers with staphylococcal immune evasion proteins before natural exposure to Staphylococcus aureus induces a humoral immune response in serum and milk. BMC Vet Res. 15 (1): 15. Pérez-caballero, R. et al. (2018) Comparative dynamics of peritoneal cell immunophenotypes in sheep during the early and late stages of the infection with Fasciola hepatica by flow cytometric analysis. Parasit Vectors. 11 (1): 640.